Fourteen young Tory ladies were selected by Major John André as the “foremost in youth, beauty and fashion” in Philadelphia to participate in the Meschianza in May of 1778, a tribute to retiring General William Howe. Among them was REBECCA FRANKS. As he did with others in the group, André painted Rebecca’s portrait in miniature and penned several lines of poetry to go with it. In 1782, Rebecca married an English officer, Lieutenant Colonel Henry Johnson, the commander of the British outpost at Stony Point, New York, which he had been forced to surrender in 1779. She and her husband left for England shortly thereafter and settled in Bath. When Johnson was sent to Ireland to deal with rebels Rebecca went with him. It was from a musty old castle in Killarney that she wrote to her friend (and her mother’s first cousin) “Willie” (Williamina) Bond who had married one of Washington’s officers, Gen. John Cadwalader. She is clearly nostalgic for Philadelphia and its exciting social scene. It is interesting to note that Rebecca and many other women in her social circle maintained friendships across oceans and political divides. Peggy Shippen was her friend before she married Benedict Arnold, when he defected, and afterward when she came to London. On the other hand, she did not much care for Ann Willing Bingham. Excerpts of Rebecca’s letter follow. Do notice an expression for pregnancy I have not encountered before. The night before last I had the satisfaction of hearing from you, a pleasure I wish much more frequently I could enjoy. But the vile sea — how much happiness does it deprive us of — but most willingly wou’d I encounter its dangers to visit Phila[delphia] again — but alas — I fear I never can hope for that ALL your eloquence will not prevail while he can he will stay, either in Ireland (where we are now) or England, and his wife must obey. I couldn’t help smiling at that part of yr letter that so gravely reprobates grandeur & dissipation — you are indeed consum’d Old Lady — now if I who have it not in my power to enjoy such things — was to rail against them the world might excuse me — but in you who have all the rich gifts of fortune ‘tis laughable really — Becky [Rebecca, a sister of Willie’s husband] tells me you are again in for the plate [pregnant], poor Toad. Why don’t you follow your Mother’s wise example — she always contrived matters so as only to be that way once in 7 years. . . . I can tell you very little of yr American acquaintances in London as I left the place last August & indeed when there I knew very little of them except Mrs. Arnold who always behav’d more like an affect-te sister than a common friend, she still continues the same. I hear every week or fortnight from her, she expects to be confin’d [give birth] the beginning of next Month. . . she was & is still more noticed and more liked than any American that ever came over. She is visited by people of the first rank & invited to all their houses. Rebecca goes on to tell her friend how others of their acquaintance have been received in London society. A measure of popularity was the number of invitations to tea or a party a lady received, and of course the number of invitations she extended to other women. These rounds of visits took up much of the time of socially prominent women. Mrs. P[enn] was too violent an American to have any intimacy with a British officer’s wife – she is lately lain of a son — Mrs. Bingham [Ann Willing, one of the most beautiful women in Philadelphia, married to William Bingham, said to be the richest man in America] arriv’d but a little while before I left London & while I was confin’d so did not see . . . her . . . [she] . 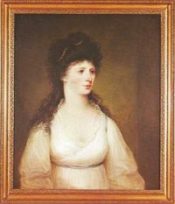 . . spent part of the Summer at Brighthelmstone where she was much admired[;] in London She is not known & I hear has had but six ladys to visit her since her arrival. At first she talk’d of going to court and living away at a great rate but that Idea is now quite thrown aside & she finds an American in London & an American in their own country quite different beings. Mrs. Arnold is the only one who has been the least Notic’d . . . . Returning to Bath after putting down the Irish rebellion, Henry Johnson was given a baronetcy; Rebecca became Lady Johnson. The couple had two sons, one of whom was killed at Waterloo. Rebecca died in 1823; she never did return to Philadelphia. The painting of Rebecca Franks, courtesy of Naomi Wood Collection at Woodford Mansion. “Dear Mrs. Cad: A Revolutionary War Letter of Rebecca Franks,” Mark A. Stern, American Jewish Archives Journal; original at the Historical Society of Pennsylvania, Cadwalader Collection (#1454), Series 3X, Box 71, Williamina Bond Correspondence, Letter B. Johnson to Williamina B. Cadwalader, February 19, 1784. Michael J. F. Sheehan holds a bachelor’s degree in History from Ramapo College of New Jersey. He is the Senior Historian at the Stony Point Battlefield State Historic Site where he has been for nine years. 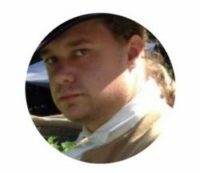 Michael has spent most of his time studying the American Revolution with a focus on the role of the Hudson Highlands and Lower Hudson Valley, where he has lived his whole life. In his free time, he is currently working on a book about the history of King’s Ferry during the American Revolution and he has been playing live traditional Irish music in the Stony Point area for five years. 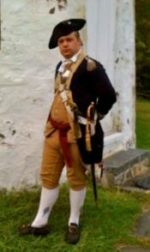 Deeply involved in the Brigade of the American Revolution since 2008, Michael has reenacted and spoken at countless historic sites and societies in New York and New Jersey, and is currently serving as a board member for Lamb’s Artillery Company. Here is a photo of Mike in his 18th century attire on the day my husband and I visited the site. Another article in the Journal, by Richard J. Werther, will be of interest to those of you who have read my posts on GRACE GALLOWAY, the loyalist wife who stayed behind in Philadelphia, when her husband and daughter fled, to try to prevent their property from being confiscated. See my posts here, here, here, and here. Read Werther’s piece here.